Goodwell, Okla.—Junior Addison Munsch posted a game-high of 28 points Saturday afternoon in the Aggies' Sooner Athletic Conference down-to-the-wire victory over Southwestern Assemblies of God University (66-64). Munsch clinched the win with two successful free throw shots with one second left in the game. The winning shots came after a clutch three-pointer by senior Monti Regier tied the game at 64-64 with 35 seconds left on the clock. Fans were kept on the edge of their seats for the full 40 minutes as Panhandle State edged a two-point advantage in the first period (15-13), and entered the locker rooms down by two points at the break (30-18). A high-scoring third quarter saw the Aggies outscore their opponents 24-20 to re-claim a two-point lead (52-50) going into the final ten minutes of play. Nadia Hayes helped pull Panhandle into a five-point lead (56-51) with a layup and two shots from the line. Four straight turnovers by the Aggies allowed the Lions to gain an eight-point advantage at the 2:39 mark, but Munsch managed to land three consecutive shots to edge the Aggies within three points with 1:19 left in the game. A missed shot by SAGU followed by a turnover put the ball back in Aggie hands, giving Regier the green light on an open shot beyond the arc. Her on-target attempt tied things up at 64-64 with less than a minute remaining. Munsch drew a foul in the final seconds and sank both free throw shots to notch the 66-64 SAC win. Head Coach Victor Esparza exulted, "I'm proud of our team and how we were willing to grind out a win. We had a great mindset and refused to get beat." Esparza added, "Addison [Munsch] was huge for us all game long and I am extremely proud of her efforts. Monti [Regier] was big, not only with that crucial shot, but with her defense all game long. Our team defense was really good and I'm proud of our efforts on the glass." Munsch's 28 points in the game marked her second-best scoring performance this season. Teammates Taylor Acosta and Kim Best were the team's next leading scorers finishing with nine and eight points respectively. Regier's only points came off that critical, game-tying shot as she went 1-of-3 from the field on the day. Acosta led the game in assists with four and Nadia Hayes held the game-high in rebounds with nine. For the game, Panhandle State averaged 41.5 percent in shooting, 38.5 percent from three-point range and 89.5 percent at the line. The Lions carried a 37.9 percent shooting average, 38.9 percent three-point average and landed 76.5 percent of their free throw attempts. 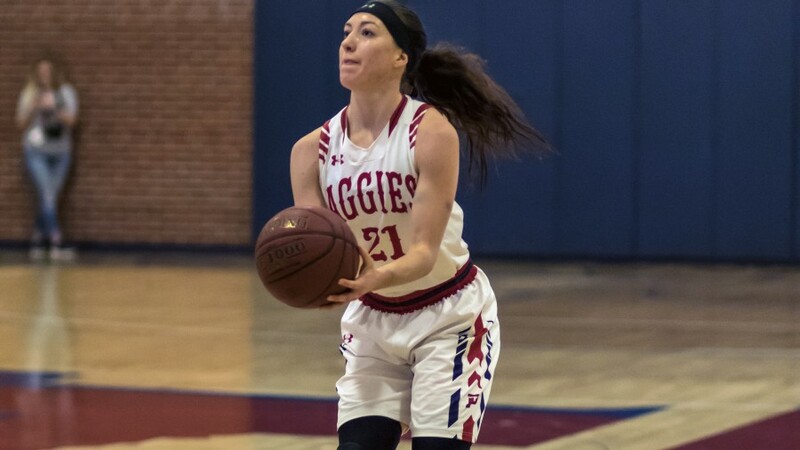 The Aggies outmatched SAGU at the boards 35-25 and outscored their opponents 11-6 in second-chance shots. Panhandle State women's basketball now holds an 8-4 season record and stands 4-2 in Sooner Athletic Conference play. The team faces a tough three-game road stint that includes contests with two nationally-ranked opponents. The Aggies travel to Bethany, Okla. on Jan. 10 to take on Southwestern Christian University at 6 p.m., and then meet with No. 10 Oklahoma City University on Saturday, Jan. 12 for a 2 p.m. matchup. The following week they face No. 6 Wayland Baptist in Plainview, Texas before returning to Anchor D Arena on Jan. 17 for a matchup against John Brown. Game can be followed online with live stats and video streaming links available at opsuaggies.com.